This track creates a loop between Flint and Steel Beach and Bay by traversing the headland between them. 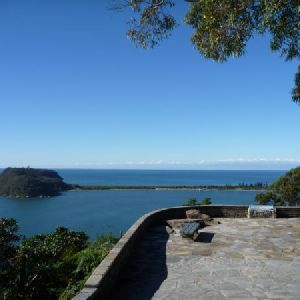 The walk explores Flint and Steel Beach and the McGaw ruins, while providing scenic views across the Hawkesbury River to landmarks such as Lion Island. * This walk passes through very remote areas and sections have no visible track. At least one person in your group should have training and experience in off track walking and navigation. Even with these notes and a GPS these extra skills and equipment are required. 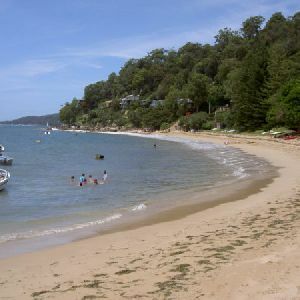 Turn around: Keeping the Hawkesbury River on the right, this walk follows the waterline onto a rockshelf, leaving the beach as it winds around to a track. 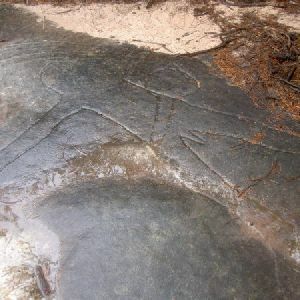 The walk follows this track as it winds up the hill, splitting for about 10m before rejoining and continuing up to the intersection with another track, near some large boulders. Turn right: From the intersection, this walk follows the track that heads through the boulders. The track continues along the side of the ridge for a short while before dropping down to the waterline (which is on the right). 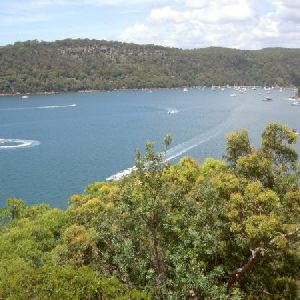 The track continues along the shore for a while, between the thick lantana-covered forest, dotted with impressive grass trees, and the Hawkesbury River. The track passes the McGaw’s Ruins and comes to an intersection with a track just on the other side. 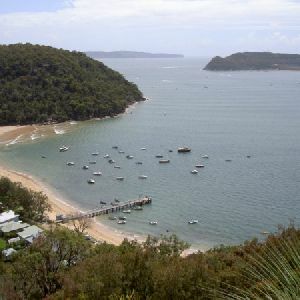 Continue straight: Keeping the Hawkesbury River to the left of the track, this walk follows the waterline away from the beach and along the shore for a short while before coming to the unsignposted McGaw ruins. At the end of this side trip, retrace your steps back to the main walk then Turn left. 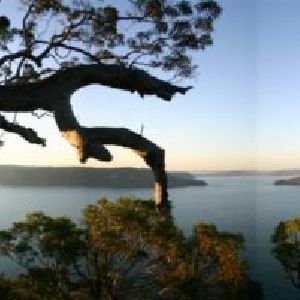 Turn left: From the McGaw ruins, this walk heads up the hill and away from the Hawkesbury River. The track climbs up the side of the valley and passes a water collection cave on the right, and soon after this, climbs up to the signposted intersection. Veer right: From the intersection, this walk follows the bush track heading up the hill and away from the ‘Flint and Steel’ signpost. 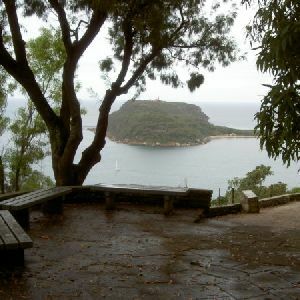 The walk climbs up a staircase that heads past an old ‘Ku-ring-gai Chase National Park’ sign and comes to the back of Flint and Steel car park. Around 1.6km of this walk has short steep hills, whilst the remaining 1.2km is very steep. 1.6km of this walk follows a formed track, with some branches and other obstacles and another 820m follows a rough unclear track. The remaining (370m) follows a rough track, where fallen trees and other obstacles are likely. 900m of this walk has directional signs at most intersection and another 820m Has no directional signs. Whilst another 660m is clearly signposted and the remaining 370m has minimal directional signs. 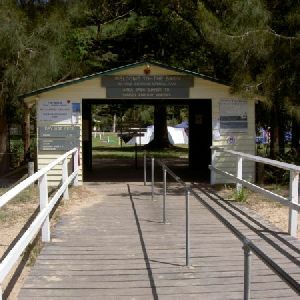 Around 1.8km of this walk requires some bushwalking experience, whilst the remaining 980m requires no previous bushwalking experience. Around 1.4km of this walk is affected by storms that may impact your navigation and safety, whilst the remaining 1.4km is not usually affected by severe weather events (that would unexpectedly impact safety and navigation). 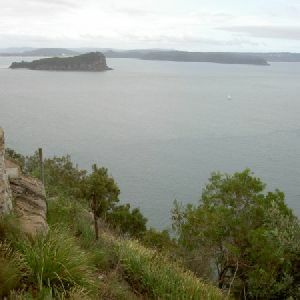 Around 1.9km of this walk has limited facilities (such as not all cliffs fenced), whilst the remaining 820m has no facilities provided. 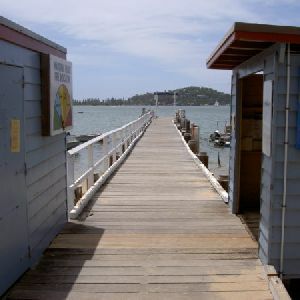 A list of walks that share part of the track with the Flint and Steel Beach and bay loop walk. 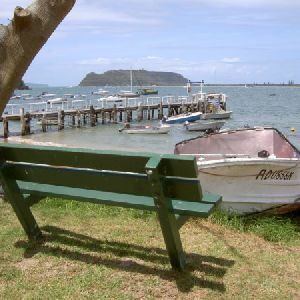 A list of walks that start near the Flint and Steel Beach and bay loop walk. 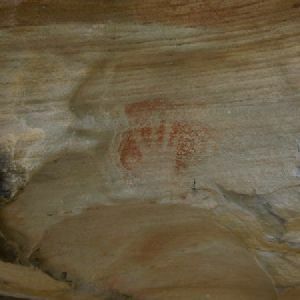 http://new.wildwalks.com/wildwalks_custom/includes/walk_fire_danger.php?walkid=nsw-krgcnp-fasbabl Each park may have its own fire ban, this rating is only valid for today and is based on information from the RFS Please check the RFS Website for more information.